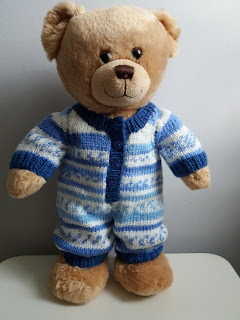 A teddy bear onesie using double knit, with either plain or an easy fair isle pattern. The pattern is in stocking stitch throughout with the legs made first then joined to continue with the body and raglan shaping for the arms. As the pattern is to fit a 15"/17" Build a bear, which are the 'sit down' type of bear, there is a lot of shaping at the back using short rows (Iv'e given full instructions for this - its really easy). If your bear isn't this type you could omit rows 19, 20, 23 and 24 on the right leg and rows 18,19,22 and 23 on the left leg. 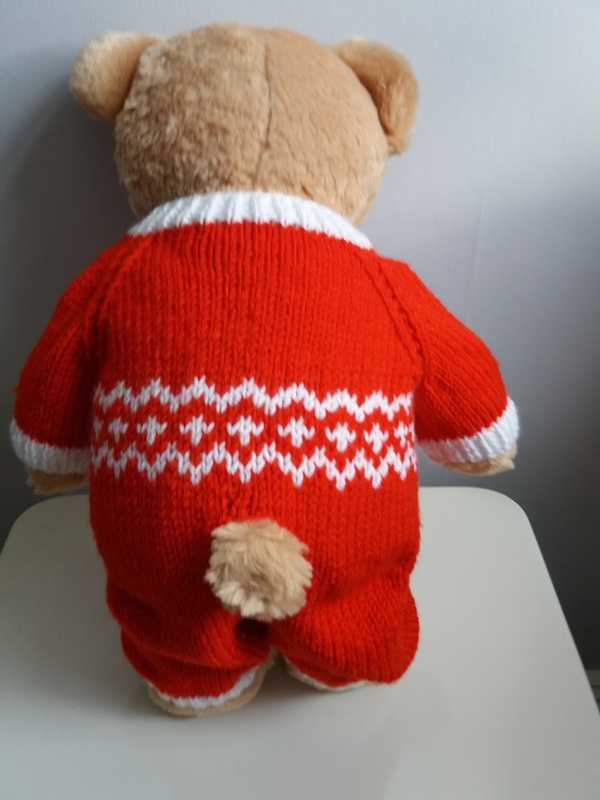 But its best to check your knitting as you go to get a good fit. I used a self striping yarn (King Cole Cherish) for the plain onesie, with a plain contrast yarn which gives a lovely effect. 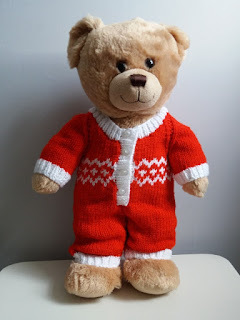 The red and white fair isle would be great for Christmas. 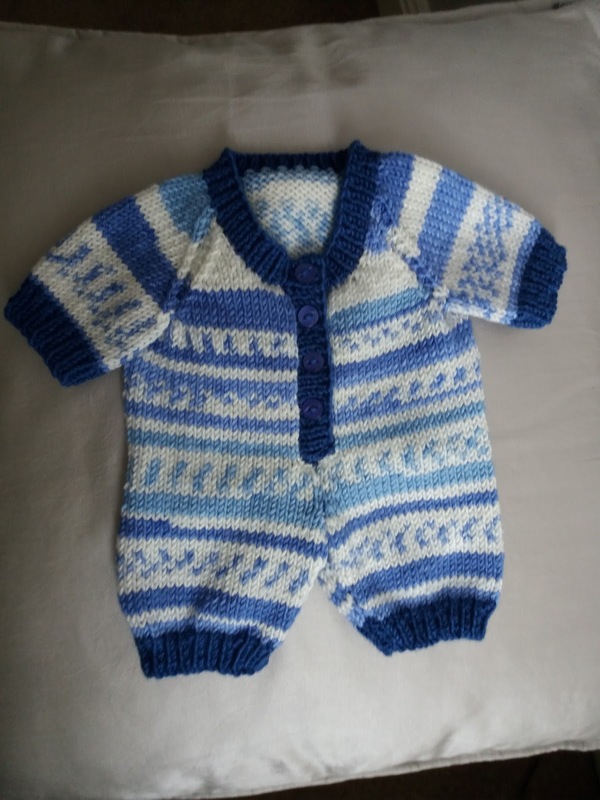 If you made this onesie please let me know how you got on (I would love to see a photo on Ravely) and if you find any mistakes or have any queries leave a comment or contact me. 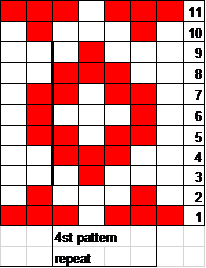 Beg with a purl row work 2 rows ss. With right side facing, using no 3.25 needles and contrast, pick up and knit 31sts along right front edge starting at first set of cast off sts to neck edge. Work 2 rows k1, p1 rib. Sew side seams of legs. Sew on 4 buttons to correspond with buttonholes. Thank you for this pattern. Have just the yarn for this.